On 24–30 April 2017, the European Region celebrates European Immunization Week (EIW), an annual initiative that raises awareness of the importance of immunization for people’s health and well-being. This year, under the slogan #VaccinesWork, stakeholders in all countries will focus on the importance and benefits of immunization at every stage of life. WHO Regional Director for Europe, Dr Zsuzsanna Jakab will visit Romania on 27-28 April to lend high-level support and visibility to national efforts to control a large measles outbreak in the country. EIW’s key messages will be further disseminated in countries throughout the Region through information campaigns, interviews, blogs, panel discussions, press releases, television programmes, scientific conferences and other activities, many of which will be attended by immunization experts from WHO and partner organizations. The initiative is celebrated each year in April in collaboration with other regions and WHO headquarters, as part of World Immunization Week. In the European Region, WHO together with many partners including the European Centre for Disease Prevention and Control (ECDC), the United Nations Children’s Fund (UNICEF), the Measles and Rubella Initiative (M&RI) and the Global Polio Eradication Initiative (GPEI) partners, will support the efforts of national authorities and civil society to raise awareness among the public and decision makers. The European Vaccine Action Plan (EVAP), adopted by Member States in 2014, offers a vision of a “European Region free of vaccine-preventable diseases, where all countries provide equitable access to high-quality, safe, affordable vaccines and immunization services throughout the life course”. Expanding access to immunization is also crucial to realizing the Sustainable Development Goals (SDGs). As a building block of strong primary health care and universal health coverage, it is fundamental to SDG target 3.8 (Achieve universal health coverage…including access to safe, effective, quality and affordable vaccines for all). Protection through immunization will also continue to play an important role in achieving other health priorities, from controlling viral hepatitis to curbing antimicrobial resistance, as well as to ending poverty and ensuring quality education, gender equality and economic growth. While much progress has been made, including in the effort to eliminate measles and rubella from the European Region, key challenges remain. Gaps in coverage have led to avoidable disease outbreaks in the European Region, affecting people of all ages. Every child deserves an equal opportunity to lead a healthy life, and vaccination is one of the vital first steps to accomplish this. Children below 5 years of age are at special risk of developing serious complications or even dying from vaccine-preventable diseases. Vaccines given according to each country’s routine immunization schedule provide the best possible protection for children when they need it most. By blocking the further spread of diseases, vaccinated children help shield those around them from preventable diseases; this includes siblings that are too young to be vaccinated, classmates with special health conditions and elderly grandparents. Vaccination is not just for the young; immunization continues into adolescence to protect children far into the future. The vaccine against human papillomavirus (HPV), administered preferably before a person’s first sexual activity, is the first step in comprehensive cervical cancer prevention and control. The protection provided by some vaccines wanes over time, so booster doses of diphtheria and tetanus in adulthood are needed to ensure life-long protection. Routine immunization schedules have also expanded over time, meaning that many of today’s adults were not offered currently-available vaccines when they were young. Staying up-to-date with vaccinations protects the individual, but also family, friends and others around them, from serious and potentially fatal diseases. Health workers, in particular, are encouraged to ensure that they are fully vaccinated and to communicate the benefits of vaccination to parents and caregivers. Health workers are at a special risk of contracting contagious diseases and passing them on to their patients, so WHO advises them to stay up-to-date with their own vaccines. 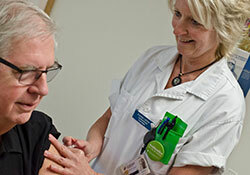 A health provider’s attitude toward vaccination has a strong influence on the decision-making of patients and parents.